The U.S. Fish and Wildlife Service (FWS) is proposing to allow nine oil and gas companies to kill bats from five species, including endangered and threatened species, for 50 years in Pennsylvania, Ohio, and West Virginia. The Scoping period for a yet-to-be drafted Environmental Impact Statement (EIS) was open for public comment through December 27, 11:59 pm. The endangered Indiana Bat, threatened northern long-eared bat, eastern small-footed bat, little brown bat, and tri-colored bat would be included in the “Incidental Take Permit”. The companies will have to prepare a “Multi-State Habitat Conservation Plan”. The destruction of these bats and their habitat would include all stages of gas and oil exploration and development in Pennsylvania, Ohio, and West Virginia including gas well sites, pipelines, access roads, frack pits and holding ponds. Action alerts issued by DRN spurred public comment on the US Fish and Wildlife Service proposed Incidental Take Permit (ITP) and Habitat Conservation Plan (a plan that the nine companies have to get approved to be eligible for an ITP). DRN submitted extensive comment to FWS opposing the ITP. DRN also signed on to technical comments submitted by the Center for Biological Diversity. DRN staff also developed comment that was submitted by Pennsylvania’s Clean Water Campaign Exceptional Value Waters work group. The nine fracking companies that are developing the Habitat Conservation Plan are: Antero Resources Corporation; Ascent Resources; Chesapeake Energy Corp.; EnLink Midstream, EQT Corporation; MarkWest Energy Partners, MPLX, Marathon Petroleum Corp. (all one group); Rice Energy, Inc.; Southwestern Energy Corp.; and the Williams Companies. After the Scoping period is completed (30 days, ending 12.27.16), then if the ITP process moves ahead, a Draft Environmental Impact Statement (EIS) will be issued by FWS for comment. When the draft EIS is issued, the draft Habitat Conservation Plan (HCP) will also be issued for public comment. Then the Findings document will be issued along with a Biological Opinion by FWS. After that, if the ITP is continued, the final EIS, HCP, Biological Opinion and Findings will all be issued. DRN is working in opposition to that final approval ever occurring. Other organizations in the 3 designated states and beyond are also working towards that end to save these bats from destruction by the oil and gas industry. In the conclusion to DRN’s comment, DRN urged FWS to not approve the ITP based on abundant evidence that the impacts of oil and gas development in the three states will cause harm to the five bat species, which will endanger their presence in the wild. This is prohibited under Section 9 of the ESA and is contrary to FWS regulations, disallowing these proposed actions under Section 10 of the ESA. DRN arrived at this conclusion because of the already imperiled condition of these species (due to white nose syndrome, human interventions such as wind turbines and development, logging, climate change and habitat loss) and the documented statistical evidence in Pennsylvania and the Marcellus shale region of water contamination, environmental pollution, habitat degradation, greenhouse gas emissions from oil and gas development, and the reasonable expectation, based on field experience, that implementation and enforcement of the ITP and HCP will not successfully avoid or minimize the taking of animals in the proposed five bat species. 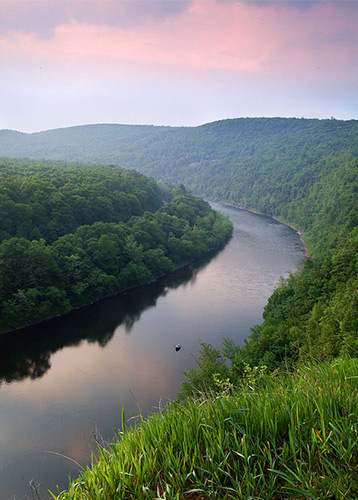 Under NEPA, DRN considers the harms that will result from the ITP will significantly affect the human environment as well as the habitat for these imperiled creatures and that these impacts are not mitigatable. If the project progresses, a comprehensive environmental impact statement under NEPA is required that analyzes cumulative and secondary as well as immediate and individual impacts and alternative actions to the proposed action.